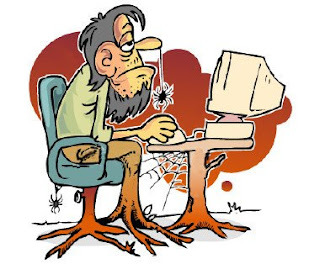 I am having real problems with the internet today; my diagnostics say everything is fine; I have a connection speed of 4.8 Mbps but web pages are taking ten minutes to load. I think the server may have swine flu. Officers raided 56-year-old Michael Wolker's flat after he was stopped leaving a club with three pairs of used underpants in a bag. And found more than 1,000 pairs. Wolker also had more than 100 pairs of swimming trunks, they were all evidently in use, but had been washed and neatly stacked away,' a police spokesman said. Wolker denies stealing the underwear, claiming he obtained them over the internet and from car boot sales. Yeah right, most men have about seven pairs (not me of course I have at least, well eight pairs), and if they are single maybe less than that. Because as the old adage goes “you can only wear one pair at a time”. 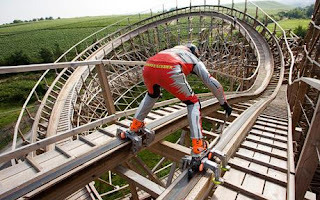 Wearing specially designed in-line skates, Dirk Auer made the attempt at the Trips Drill theme park in Stuttgart, Germany. Reaching speeds of 90 kph, Mr Auer skated the 860 metre track in just over one minute. This was a very dangerous stunt because there were so many factors to consider," said the 36-year-old, who conquered the rickety ride last weekend. "The roller caster is wooden and so unlike rides made from iron and steel there was always a chance of the odd nail or screw that would not be entirely flat. "If the skates were to catch a stray nail then I could have fallen and I would almost certainly have died." Spending two months planning the outrageous stunt, Dirk also designed and made the monster skates, which took him a total of 110 hours work. He already holds the world record for reaching speeds of 307 km/h as he was dragged along behind a Porsche GT2 and has raced down a roller-coaster wearing only his skates. Dirk, from Gross-Gerau near Frankfurt, is considered to be the most extreme inline-skater in the world. That is not the description I would use. A sexually suggestive ad campaign for Mattesons smoked pork sausages has been criticised by the advertising watchdog. The innuendo-filled radio adverts for Mattesons sausages asked listeners where they would like to "stick it". The Advertising Standards Authority (ASA) upheld complaints that the ads should not have been aired when children were likely to be listening. The ASA ruled that the four adverts, broadcast on Forth One, Clyde Radio and Real Radio, must no longer be aired at times when children were likely to be listening. It is obvious where you would “stick it” isn’t it? Yet more maniacs have decided to cross a Citroen 2CV with a Ferrari – and produced a bread van which can travel at 180mph. The bizarre hybrid took the pair five years and cost more than £150,000 to put together. 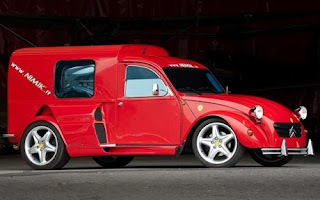 They took the chassis and engine of a speedy Ferrari F355 Berlinetta and combined it with the body of a 12bhp Citroen 2CV Fourgonnette bread-van. And they stuck the iconic prancing pony logo on the front above the famous Citroen double chevron emblem. The result of their efforts is a striking vehicle that can accelerate from 0 to 60mph in less than five seconds. The car was put together by Nicolo Lamberti, 35, and Milko Dalla Costa, 51, who run the Italian Nimik rally team. Mr Lamberti said they found the Ferrari at an "interesting price" and decided to modify it. They had the idea to combine it with the 2CV after seeing it abandoned in the back of a garage in Turate, in Northern Italy. That is a lot of bread for well, a bread van.